Camping in South West France is one of the best ways to enjoy one of France’s most beautiful regions. Inland, discover sloping vineyards, meandering rivers, tranquil market towns and rolling fields of sunflowers, while the coast offers glorious stretches of golden sand backed by dunes and pine trees, and the waters are ideal for watersports. Our campsites in South West France are on the Atlantic coast, near the stylish resort of Biarritz. Bordeaux Best known as the wine producing capital of France, Bordeaux is a city port on the Garonne river, with grand 18th century architecture, wide boulevards and excellent shopping, its wealth largely derived from iconic vineyards. Try the tasting machine at Aux Quatre Coins du Vin and be sure not to miss the fabulous covered market at Le marché des Capucins. And did we mention the wine? Biarritz The resort of Biarritz is world famous for its surfing, and chic boutiques selling designer labels as well as surf gear. Espadrilles are everywhere – perfect holiday footwear and a great souvenir to take home from holidays in South West France. Close to the Spanish border and enjoying a mix of cultures, the town also has some stunning golf courses. 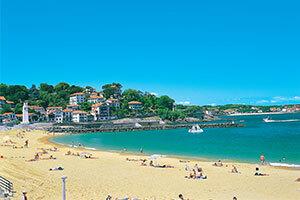 St Jean de Luz A seaside resort and fishing port, and once the home of Basque corsairs, St Jean de Luz is home to colourful festivals during the summer months. A visit to the Écomusée Basque Jean Vier will give you real insight into this fascinating culture, and includes free tastings of the herb-flavoured Izarra liqueurs. Enjoy Impressionist and modern art at the Galerie Eraunsia. Arcachon Arcachon is a popular boating venue and a major European centre for oysters. Enjoy a boat excursion in the bay or relax on one of the fine sandy beaches. The cliff road to the south brings you to the highest sand dune in Europe, the Dune du Pilat. Climb right to the top for a magnificent view of the Arcachon basin. Bayonne Bayonne is the chocolate-making capital of France, if not Europe, its products so renowned they were once prescribed as medicine by Parisian doctors. Indulge yourself with a cup of amazing frothy hot chocolate and a tour of the city’s artisan chocolatiers. A slice of air-dried Bayonne ham is another authentic treat. One of the top attractions of the town is the Basque Museum, a lovely old building crammed with items of interest. Dax This historic city is France’s leading spa town, thanks to its hot springs and the therapeutic ‘Péloïde’ mud. The Fontaine Chaude is built on the site of the Roman baths. There’s also an interesting aviation museum. To find your perfect campsite in South West France please use our interactive site finder, call our knowledgeable customer advice team on 0345 268 0827, or go straight to the individual campsite pages.